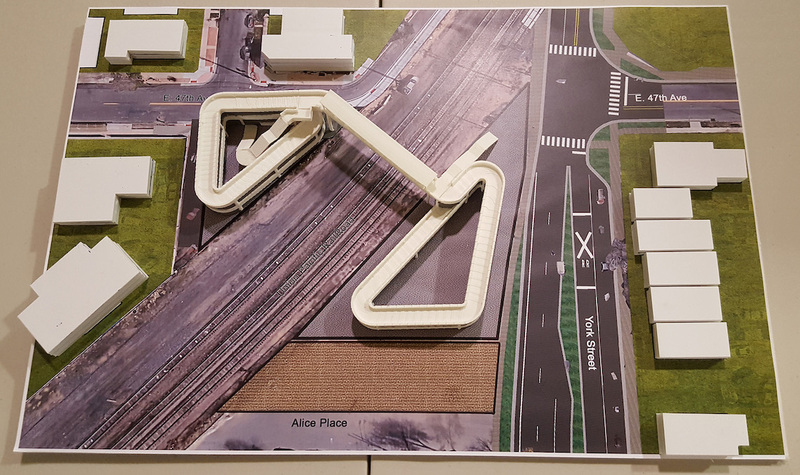 In conjunction with developing design plans for a bicycle and pedestrian bridge to span the railroad tracks at the intersection of 47th Avenue and York Street in North Denver, CIG worked with Wilson & Co. to conduct two public meetings at different phases of design development. Both meetings were designed to update community members on this much-anticipated project and gather their input on various project aesthetic elements. The first meeting – conducted Jan. 17, 2018, at the Colorado Miner’s Community Center – marked the first public meeting since the conclusion of the city’s East/West Connectivity Study in 2016. This study involved significant community input and resulted in a recommended bridge design and a preferred alignment for the structure. With Wilson & Co. brought on to advance the design and identify improvements to the alignment, one of the goals of this meeting was to highlight improvements made to the initial concepts. The January 2018 meeting also served to remind people of the work that went into developing the East/West Connectivity Study in the first place. Project representatives attended an after-school program at the Valdez-Perry Library to show the 3D model of the bridge and talk with students about the benefits this bridge will bring in helping them walk safely to and from school when trains are on the track. Project representatives participated in Swansea Elementary School’s Trick-or-Treat Off the Street event, passing out candy and displaying the 3D model to help build interest and excitement. Project representatives attended a “Muffins with Munoz” meeting at the school to show the 3D model and discuss the project with parents and school administrators. A 3D model helped community members visualize the project. Using boards illustrating various aesthetic options, community members were invited to place stickers on the pictures representing the aesthetic elements and public space characteristics they would most like to see incorporated on this project. For those who couldn’t attend the meeting, a bilingual survey was posted online to gather feedback and written copies of the survey were gathered from people at the GrowHaus, Focus Points and Valdez-Perry Library in the two weeks after the public meeting. Along with feedback from the 25 people who attended the public meeting, we collected feedback from 11 online surveys and 36 in-person, written surveys – 16 of these in English and 20 in Spanish. All survey feedback was captured in a synopsis report and will be provided as part of the design package given to the contractor ultimately selected to build the bridge. To close the loop on the public engagement process, the city conducted a final design-phase open house meeting on Nov. 14, 2018, at the Johnson Recreation Center. At this meeting, community members had the opportunity to view boards portraying the near-final structure design. These graphics gave community members a good sense of what the structure will look like when it opens for public use in late 2019. At this final meeting before a contractor is selected and construction begins, community members were also asked to provide input on three general color schemes for the bridge. Of the options presented, most preferred the look of a patina (or rust-colored) steel with turquoise blue accents, giving the bridge a southwest character.